Located south of Mobile, this hotel is 15 minutes from Hank Aaron Stadium and Exploreum Science Museum. It features an outdoor pool, gym and rooms with a 32-inch flat-screen TV. A microwave, coffee maker and refrigerator are offered in every room at the Mobile Hampton Inn. Free Wi-Fi and a work desk are also included. A hot buffet breakfast is served daily and a free beverage center is available. 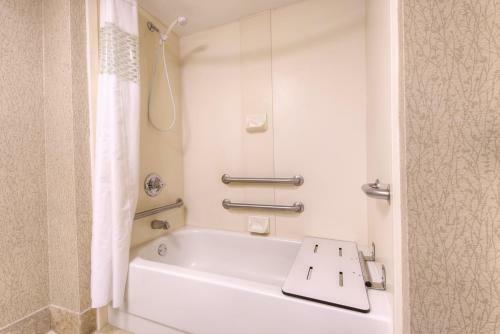 Hampton Inn Mobile-I-10/Bellingrath Gardens has an on-site business center and laundry room. University of South Alabama is a 15-minute drive from the Bellingrath Gardens Mobile Hampton Inn. Dauphin Island is 40 minutes’ drive away and Bellingrath Gardens is only 11.5 miles away. the hotel Hampton Inn Mobile-I-10/Bellingrath Gardens so we can give you detailed rates for the rooms in the desired period.